Antelope Canyons are located at the south east direction of Page, Arizona. From Page drive southward on US-89 for a short distancce, and then turn left into Rt. 98 toward east. First pass through a trafic light, keep driving toward three tall chimneys of Navajo Power Station. At a cross road the sign says left to "Antelope Point and Lower Antelope Canyon", and right into the parking lot of Upper Antelope Canon. If turn left, shortly will come up to the side road that leads to the parking lot of Lower Antelope Canyon. 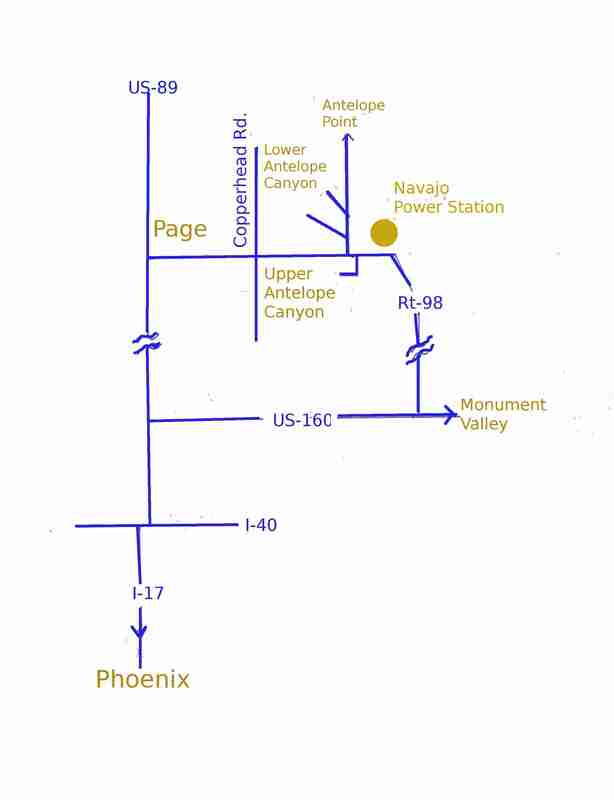 A simplified map is posted at the right to show where abouts of Antelope Canyons. Antelope Canyons are more like caves with openings on the ceiling. Inside the canyons light is dim. With naked eyes only see dim greyish walls with many curved equally spaced lines formed by compressed sand stone layers. In other words there is nothing spectacular through naked human eyes. However, once looking through digital cameras, suddenly an "Alice in Wonder Land" type fantacy world appears. With colors and changing hues, so many structures appear from no where. That is why Antelope Canyons are famed as the "Paradise of Photgraphers". Why such fantastic results by looking through a digital camera? Some claim that digital cameras are much more light sensitive than human eyes so can see better under dim lights. That claim is false. Human eyes are much more sensitive to dim lights than most of the digital cameras on the market. Only very high end DSLR with high ISO or very long exposure can compete with human eyes in dim lights. The pictures we are going to show are all taken from two SONY pocket size point-and-shoot cameras of 2007 to 2008 models. The secret behind the fantacy world of Antelope Canyons is the "light polarization". Human eyes cannot distinguish light polarization so cannot see the fantacy world of Antelope Canyons, but digital cameras can distinguish polarized lights; actually digital cameras use light polarization to measure distances. In animal world some species can distinguish light polarizations. For example, butterrfly is known to be sensitive to polarized blue light; it uses the capability to judge freshness of a vegetation. Now let us see how the light polarization creates the fantacy world of Antelope Canyons. The white light from the sun is the mixture of unpolarized lights of all sorts of colors. When a stream of unpolarized light reflects on a non-metalic surface, the reflected light becomes polarized. The degree of the polarization of the reflected light depends on both the reflection angle and the color of the light. When a stream of white sun light is reflected from a non-metalic surface, the human eyes still see a stream of whilte light due to the inablitity to distinguish light polarization. Howeverr, if we see through a polarization filter, a totally different picture emerges. A polarization filter has a prefered direction. Only the light with a polarized angle consistent with the prefered direction of the filter is allowed to pass through the filter. Thus if we look at the reflected stream of sun light through a polarization filter, by rotating the filter to change its prefered direction, we will see the reflaected light to change color. In th dim setting of Antelope Canyons, the light reached visitors eyes and camera lens has probably gone through multiple reflections, so the polarization effect is further enhanced. The light from one spot of the wall and the light from a nearby spot will have different degree of polarization depending on the color. A digital camera that is capable to distinguish light polarization will see different color and hue from the two nearby spots, whereas human eyes will not notice any difference of the two nearby spots. With the dense curved parallel lines formed by the layers of sand stones, a surreal picture thus appears through the lens of digital cameras in Antelope Canyons. The above discussed polarization effect is not unique for Antelope Canyons. In any narrow canyon where direct sun light does not overwhelm the polarization effect similar color and hue change through digital cameras should be expected. Similar phenomena are actually recorded in other slot canyons. But by far Antelope Canyons yield most spectacular pictures and attract most visitors including numerous professional photgraphers. We have found that the narrows of Willis Creek in Grand-Staircase Escalante National Monument produce pictures comparable to those from Antelope Canyons, but the color-hue and textures from two places are quite different. 1. It is advised not to use flash light in Antolope Canyons. Considering the light polarization effect, the unpolarized light from the flash is going to ruin the pictures when it gets directly into the cameras. 2. It is advised not to aim cameras at the openings at the ceilings. Apparently when the bright sun light directly gets into the lens, all the polarization effect will be overrwhelmed and the picture ruined. However, it is a judgement call. We have found that aiming to the ceiling openings will produce stunning pictures from time to time. An interesting question naturally will come up. What happens if we use an old fashion film based camera to take pictures in Antelope Canyons. If use a simple film based camera with optical range finder, that is, with a separate lens from the main camera lens as the view finder, the image through the range finder should be similar to what the naked eye will see. But on the film we do not know the result. More interesting question will be what if we use a film based SLR camera, setting the ISO and shutter speed the same as a DSLR, what will be the result. Next time if have chance to visit Antelope Canyons again, we will try out the experiment. Antelope Canyons are located at the down stream of a long valley. If at the upstream of the valley a heavy rain developes, flood will wash down the valley, flows through Anelope Canyons, and drain out to Lake Powell. In other words Antelope Canyons are drainage tunnels for the flood water. During a large flood, water level inside the canyons can reach 10 feet or more. In 1997 such a flood had claimed more than 10 victims in Lower Antelope Canyon. Presently scouts are placed at the upstream of the valley. If rain is spotted, the scouts will immediately call the entrance stations and visitors will be evacuated. If rain is in the forecast, both canyons will be closed. To aid the speedy evacuation in emergency, steel stair cases are installed in Lower Antelope Canyon in various places. One of our acauqintance said that they were actually evacuated from the Lower Antelope Canyon on a summer day.